I have 5 kids and all but the youngest have tablets (or phones for the oldest ones). Each tablet has fun games, and music that they love to sing and dance too. Unfortunately, this also leads to music battles, when they all try to play their music louder than the other. The logical solution would be earphones. One day I walked by during electronics time and noticed that I could hear everything coming from their headphones. My first thought was: that can not be good for their hearing. My husband has some hearing issues because he listened to his music super loud as a teenager. 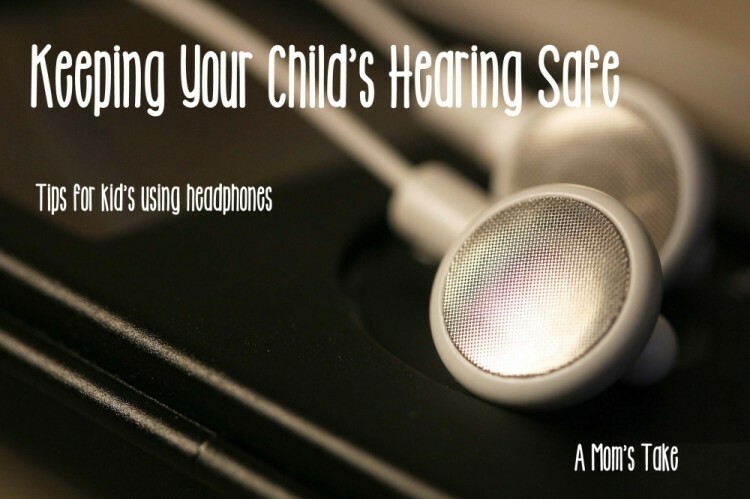 Keeping Your Child’s Hearing Safe during headphone use can be easy. Here are a few tips to help! Limit your child’s use of headphones to an hour at a time. Take breaks in between. This should be pretty easy because no one wants their kiddo staring at a screen forever! Many devices have maximum volume limits in the settings. My Galaxy Note 2 has a volume feature in the settings that allows you to change the maximum volume on games, videos and music. Unfortunately, many older kids (although nowadays it’s around 4) can figure out how to change that pretty easy, so take advantage of password locks on your device settings. If you can hear what your child is listening to with their headphones from a few feet away, it’s too loud. Have them turn it down right away. Half the maximum setting is the loudest they need to go. If they complain that they can’t hear, have them go to a quiet room. Harley listening to a story..yes she is dressed like Elsa. I received a pair of JBuddies Headphones in exchange for this post. All opinions are my own. Many headphones for kids have lower maximum volume setting preset. Kid safe headphones also go over the ear, not in them like earbuds. Earbuds are too tight in the ear so sound can’t escape. Child headphones are also great because they actually fit their head and ears making it way more comfortable. JLab Launches the next generation of Kid Headphones, JBuddies Folding. 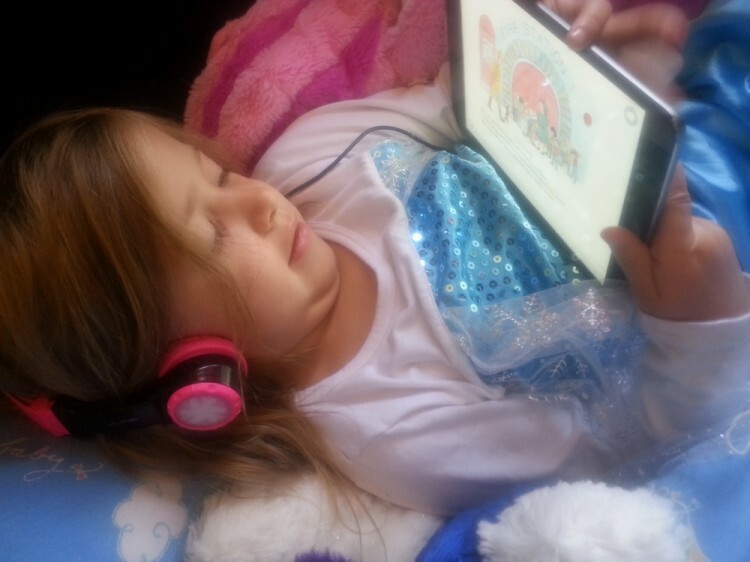 JBuddies Folding Headphones for Kids offer safe-volume control. They are made with built-in volume regulators, to ensure kids never rock out past 85db. They are perfect for traveling, since they fold down and fit in a cute bag. Since every kids is different JBuddies include 8 3-D character stickers so they can customize their headphones. The first thing we noticed with the JBuddies Folding Headphones was that they were exactly the right size. They fit my youngest (19 months) up to my 12 year old daughter. They easily adjusted for the next child, with just a few clicks on the headband. They also worked on all our devices…all of them. I never realized how many we had! Then the real test came, my oldest daughter wanted to use them when she worked out at the gym. I went to my Zumba class, then came by to check on her. “Mom,” she said,”the headphones won’t let me go up that loud.” She is one of my worse offenders of having music turned up too loud, she was the only one that noticed, and it didn’t bother her. She was able to listen and enjoy her music, just at a safe level! JBuddies Folding Headphones are very affordable, and would make an amazing gift. They are also perfect for the summer road trip, or just so you don’t have to hear “Let It Go” one more time! Pick them up here. No matter the age, we all should try to keep our hearing safe and turn the volume down! Do you monitor the volume of your child’s device? No, but I would love to get him a pair. Both my boys have ear tubes and are so sensitive to loud sounds! My daughter does not use headphones yet, because the ones I own do not have a volume limit. These would be perfect for her to use while she’s playing online. We don’t have specially designed kids headphones so… no. My son does but my daughter needs some for her ipod. These would be perfect! Not yet but we really don’t use tablets too much. This would be great for when we travel though. We have not used headphones before, but have thought about getting a pair to try with Carter! She’s a musician — loves headphones!!!! My daughter doesn’t use headphones but I wish she would. Yes, my child has to use headphones for certain applications at school. I always listened to headphones WAY too loud and I am paying the price for it now. Its so important with all the devices kids use these days. I’ve really limited our kids time. My child does use headphones. I always worried about this because my ex listened to the TV sooooo loud. I worried my kids were going to have hearing damage and that they’d begin to think that’s how loud the volume should be. My daughter is just learning to use headphones. She actually has a hearing issue, so sometimes we have to turn the volume up, BUT… kids safe headphones seem like the best idea! Once we get her hearing under control, we will be getting her a pair of these. I think it is time my kids actually started to use headphones. I’m tired of hearing their games at regular volume from them playing them. Headphones would be nice. These are great tips to help them use them responsibly. I argue with my daughter all the time about the volume of her music. When I can hear it through her headphones, that a no no! Yes she uses them in school..
Not yet they haven’t used them, but we talked about it and are thinking it is close to time. I do monitor the volume on their devices but I’m sure they set it louder when I’m not looking! It’s so important to protect kids’ hearing! My son had hearing problems when he was young so I am strict about headphones and things like that now. When my kids have their headsets on I constantly check for volume control! I generally don’t let my girls use headphones. They are a bit young. My oldest knows to not blast her music. We have been searching for some headphones for our little one, so glad I saw this! Sometimes he will use them but not often. The buds hurt his ears. No, my baby girl is 7 months old right now, so she hasn’t worn headphones yet! I’d like to get some for her for when we travel, when she’s a little bit older, though! Thanks for the opportunity. Only when we are in the car. Yes, my son uses headphones. Periodically. When we’re on a road trip she’ll usually have them on. Sometimes in her room if she’s watching a show on her device in the early morning. She doesn’t have ear buds but I’m not 100% sold on the ear phones we have for her. .:karen:. Yes she uses them for her iPod. Not yet, but I’m sure these would come in hand in the future. Yes, the little one has used headphones. She only uses headphones with her LeapPad Ultra and they are the Leap headphones.